They’ve gone to bed for another year: The next Bryant & May mystery, ‘The Bleeding Heart’ has been fully finished, the two edits and proofs (US and UK) have gone back – they’re quite different – and the covers have been created. The UK cover reflects the darker, more gothic tone of the novel, although as the US chose banana yellow for ‘The Memory of Blood’ who knows what we’ll get from them this time? You’d think that with the last page closed and my desk cleared off, I’d do a Stephen King and have a smoke or something. But no, ‘Nyctophobia’, out next Hallowe’en, will need to be signed off too, and a new draft of my dark thriller ‘Find Me’ needs to be finished. So, a break after that? No, because then I needed to start prepping ‘The Burning Man’, the twelfth Bryant & May novel. Volumes 11 and 12 are really going to ramp up the pace; they’re both bigger, longer stories with some very large set-pieces and lots going on with all the PCU characters. The last volume came close to winning several awards this year, putting me through the mill at a number of awards ceremonies and leaving me empty-handed again (except at Bristol Crimefest, which I unfortunately had to miss). But there’s always another year. After this will come several new titles, including ‘Crazy Lady’ and ‘Dream World’. 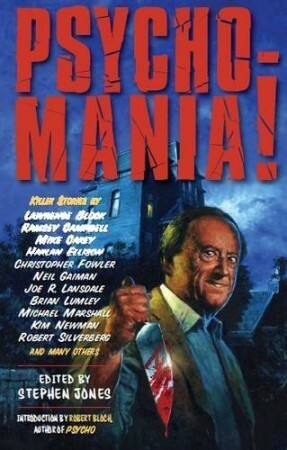 Oh, and there’s a new Bryant & May story, ‘Bryant & May and the Seven Points’ in ‘Psycho-Mania’ from Robinson, out this Hallowe’en with what is without doubt the most appallingly inept front cover I’ve ever seen, but at least I’m sharing pages with Robert Bloch, Harlan Ellison, Neil Gaiman and Kim Newman. Thank you,Admin, for always giving us something else to look forward to. More B&M , YIPPEE!! P.S sorry you didn’t win ,what a swizz! A crying shame you didn’t win for The Invisible Code. You had my vote. Superb installment. At least there’s lots more books coming. BTW, Plastic was brilliant too. Can I sieze this demi-pause to sneak in this question, what is happening with ‘Into the Dark’? Thank you for working so hard to give us (present and future fans) such beautifully crafted stories. I can’t wait to read them! As a Canadian I wonder what the differences are between the UK and USA versions (aside from the covers)? I think the vast majority of Canucks would prefer the UK version …we’re just not as insular as the folks south of the 49th. Keep ’em coming …love the PCU. The amazon cover artwork for the latest Best New Horror has your name featured but you’re not in the finished book (or named on the final version of the cover either). Was your contribution moved over to Psycho-Mania at the last minute or was it another short story that was intended for Best New Horror? I am also curious about the changes between the US and UK versions. Maybe someday you can elaborate but of course we don’t want any spoilers….